When you decide to sound proof your windows, the critical step to getting the sound reduction results you want is down to the right glass selection. What glass you use does make a difference, both in the outcome as well as in how much the soundproofing will cost. Noise pollution can have a detrimental impact on both our physical and mental well-being. Depending on the intensity of the noise you are dealing with, you may not get the quiet, calm, healthy results you were expecting without the right glass type for sound reduction. Standard double glazing may not be enough for a property near an airport or the subway to fully dampen the sound. On the other hand, you simply don’t need extra thick acoustic double glazing units for your back kitchen windows that face your backyard and are not as exposed to traffic sounds. A customised approach to address the details of your property and your noise issue – for each area of your home or building. This won’t only put an end to having to listen to noisy neighbours while you’re trying to relax at home after a long day at work, it will also help to ensure every dollar you put into your double glazing is money well spent. When it comes to soundproofing effectively, double glazing is by far the best option. However, new double glazed windows can vary tremendously in price. As long as you convert your wooden windows with a retrofit double glazing system performed by Thermawood franchisees, instead of paying for new double glazed windows (which can easily cost three times as much), and you work with professionals who are willing to help you find the required type of glass for each room, you will get amazing results for a great price. And, you’ll add value to your property in the process. Use this guide to find out what is the best glass type to reduce noise for each room in your property. Insulated glass units (IGU), consist of two panes of glass as well as the pocket of air in between the glass. But, how thick should the glass be in order to get the best results? There actually isn’t a one-size-fits-all answer. 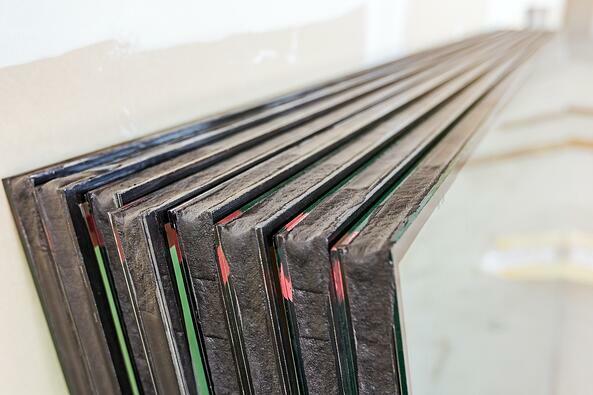 First, in an IGU, each pane of glass can be of a different thickness. It is possible to use one 4mm glazing and then pair it with a thicker pane, such as 6 mm, to dampen the decibel level more. The size of the air space in between the glazing also matters. The wider the space, the better the effect. The thickness of the total acoustic double glazing unit is important to consider as well. An IGU with an overall thickness of 12 mm (3mm of glass + 6 mm of air space + 3 mm of glass) is going to have less ability to dampen sound than an IGU that is 24 mm thick overall. What you need, and what thickness each component should be, depends on the details of your property and the source of the noise. The same IGU will be more or less effective depending on the frequency level of the sound you are dampening. Your window soundproofing professional will help you determine the best fit for your windows. They should assess the decibel level of your noise pollution in order to give you a realistic idea of how much of an acoustic improvement the thickness of your IGUs will make in each area of your home or commercial space. Does laminated glass make a significant acoustic difference? What if you just used thicker glass panes in your IGU to better sound proof your windows? Let’s take a look at why laminated glass is able to dampen more sound waves than standard glass. Where standard glass simply consists of a single sheet, laminated glass is two sheets of glass with an interlayer of plastic, usually poly vinyl butyral (PVB), sandwiched in between. The idea for laminated glass was discovered, or rather stumbled upon, in 1903 by French chemist Edouard Benedictus. When he dropped a glass flask that was wrapped in plastic cellulose nitrate he noticed the glass shattered but it didn’t break. Glass engineers have been perfecting the art of this ‘sandwiched glass’ for years, giving us the laminated glazing that is widely used today in the building, transportation and automotive industries. Not only does this interlayer make the glass stronger but it also acts as a place to embed other glass technologies to improve the glass in some way, such as fire resistance, ultraviolet filtering – and sound dampening. When put to use, a sheet of laminated glass is far more effective at stopping sound waves than standard glass of the same size because sound waves have more difficulty travelling through the combination of glass sheets and a PVB interlayer. This is why laminated glass is commonly used as a type of soundproof glass. Even using just one pane of laminated glass within an insulated glass unit will enhance the noise blocking benefits by several decibels. Use thicker glass or more air space as well as one sheet of laminated glass, and your double glazed windows will allow you to sip your cup of morning coffee and read the news in pure silence, no matter how many trucks are rumbling down the street and horns are honking during the am traffic rush. One step above laminated glass is acoustic glass. Instead of having a layer of plastic in between sheets of glass, special acoustic glass windows consist of two sheets of glass with an acoustic resin layered in between. When it comes to acoustic glass, there are different grades. SoundStop CIP – which uses acoustic resin as the interlayer. SoundStop PVB – this is a PVB laminated glass which uses an acoustic grade PVB interlayer. SoundStop EVA – this is a laminated glass which uses ethylene vinyl acetate (EVA) as the interlayer. EVA has excellent soundproofing properties and it also offers UV filtering. The difference between each grade of acoustic glass, or even between laminated glass and acoustic grade, may not be significant enough to detect. Studies show that a difference of 3 decibels is barely perceptible by the human ear. This means that unless there is a large enough difference between one type of acoustic glass and the next, you may not actually notice the difference. There is generally a difference in price, with acoustic glass commonly being the most expensive when compared to laminate or standard glass. This is why it’s important to have the necessary noise reduction amount assessed for each room of your property. The goal is to figure out what is the best acoustic double glazing unit for each room, rather than just choosing the type of glass with the best sound dampening properties overall. With acoustic glass, the best performing and often, most expensive option, is not necessarily the most ideal type of glass for a specific space. What is the optimal choice is the best value IGU component combination that is capable of meeting the noise reduction needs of a room. Often using laminated glass for high performance acoustic double glazing units, along with air space and the right thickness of a second glaze of standard glass, yields impressive results for high priority rooms like bedrooms and those facing busy streets. Using one pane of a thicker glass, such as 6 or 7 mm can create the right effect to enjoy a peaceful quiet living room or office space. If you live a stone’s throw from a railroad track, bring out the ultra-powerful acoustic glass and make sure the overall IGU thickness is substantial. Finding the best combination in terms of the type of glass, thickness, and air space for each sound dampening IGU is key to getting seamlessly soundproofed windows and adding fantastic value to your property through a reasonable investment. An experienced professional will work with you to decide the perfect soundproofed windows for each room of your house.